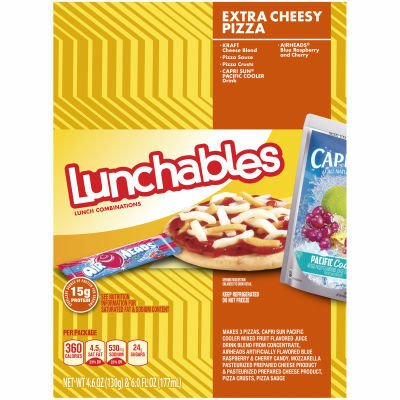 Give them a cheesy sensation to get them through their day with Lunchables Extra Cheesy Pizza. It comes with a crust made with whole-grain, Kraft Mozzarella and pizza sauce. Includes Airheads® and a Capri Sun®. A delicious, convenient, and fun option for school, picnics, or on-the-go lunch. Excellent source of Protein and Calcium.